Games Workshop is bringing back Necromunda, its skirmish game of futuristic gang warfare. 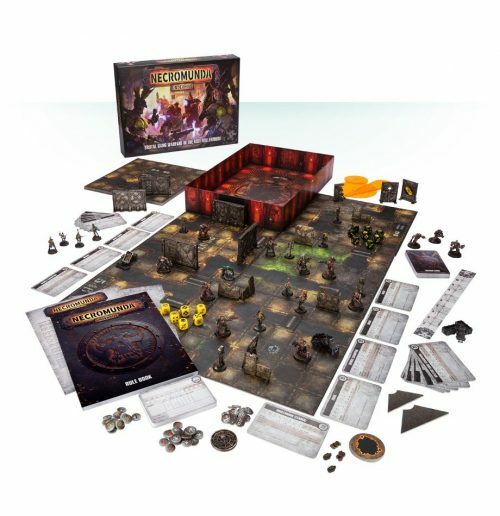 The new version, Necromunda: Underhive features a game board as backdrop and tactic cards that add a bit of chaos to the game while representing the schemes and tricks of the various gangs. The boxed base set for Necromunda: Underhive ($125) will include two gangs, each with enough pieces to assemble 10 models, as well as nine double-sided board tiles, doors and other terrain elements, tokens, dice, templates, a ruler, and a rulebook with six scenarios. Of course, there will also be available additional figure sets, terrain elements, tactic cards, and the Gang War supplement with rules for using terrain to play in three dimensions. Games Workshop is currently taking preorders and will ship the new Necromunda beginning Friday.